Most of the people who know me have long since realised I don’t do transitional material. I’m also not great at light conversation. I’ve been told of my tendency to go of on a (ranting) tangent on whatever subject has prodded me with a stick. So, I hope you’re ready for a little random venting of spleen here, for there is a recent societal undercurrent that is increasingly sticking in my craw, namely the tendency in today’s world towards what can only be termed ‘denial of failure’. 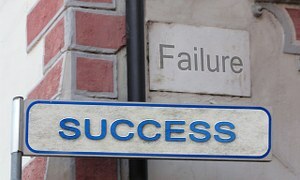 When did ‘Fail’ become a four letter word? I thought we bricked over that sign? I’m not sure when or where it started…I’m tempted to start with the so-called ‘millennials’ and work my way down the age ladder a few years but that is for a different post. What I increasingly see in primary and secondary education is the inability of grown-ups to understand the fundamental difference between ‘wants’ and ‘needs’. Students are to be given what they want – not what they need. Yes, I know, this goes clearly into the swamp of relativism, e.g. who is to say what is needed. Let me avoid this for the time being, not because it’s uninteresting but because it is somewhat beside the point. I too have increasingly seen this in schools. Somewhere along the line we grown-ups – school leaders, parents, teachers – started denying that students could fail, either through rubberised grade boundaries, deadlines that could be moved, re-weighting of tests or other standardised components and — possibly the most pernicious and hard to address issue – simply by allowing successive and endless ‘re-takes’ and ‘do-overs’. It is this last one that seriously yanks my chain, when a situation arises where school policies of keeping fail rates down coupled to students’ and parents’ expectations of high grades often lead to the most damaging results for students in the end. Wait….come back! I have a ticket! It is here I have noticed a most frustrating development in the past few years; students and parents seem to think there is a never-ending array of ‘fill-in’ tasks to attain the grade they want. This simply cannot be, I mean, all ideological arguments aside, do the maths: 80 students where 20 get grades they feel are too low and Magister now is to put together and correct an end of term test and an IA for them all. Apart from going against IB rules on IA, the sheer practical issue of time – and the likelihood that other students jump on the grade-up bandwagon “…because Jane was allowed to…” – is simply not realistic. Not to mention the situation we ultimately wind up in due to rampant grade inflation where grades cease to matter as both indicators of achievement and a method to earn university entrance. Yes, I am avoiding all the philosophical issues herein – again, that’s another post. Students have been inculcated with the notion that nobody fails from an early age. Current wisdom has it that a student getting a ‘fail’ becomes despondent and will not rise to overcome but be pushed further down. Basically a ‘self-fulfilling prophecy’ that also works in the other direction; building confidence in students will cause them to succeed. Thus teachers at low and middle school have a propensity to use grades as a means of encouragement. This feeds on up through to high school and students are unused to failing. Teachers simply cannot muster the time and energy to stand fast against both parents and, increasingly, school boards. Much easier life to simply inflate grades via do-overs than do battle that could harm a career. The end result must inevitably be an inflated sense of achievement and entitlement, something that will come to a screeching halt when final IB results are in. (Again, part of the problem being that for students being accepted to university on term results, this matters not at all.) Endless retakes, grade inflation and concomitant inability to fail. I really do wonder if this is a major element in the on-going debate at US and UK universities re ‘safe rooms’, ‘trigger warnings’ and quite alarming curtailing of what should be the bulwark of university fibre; free speech, free thought and pushing the boundaries. Just enter ‘Bill Maher + Berkeley’ and ‘Jonathan Haidt + coddling’ into Youtube search for example. Scary scenario indeed.